"Great summertime recipe! 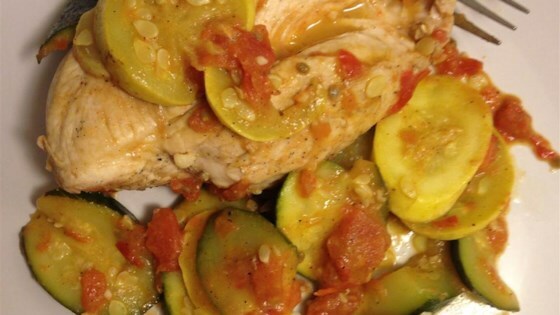 The contrasting colors of the summer squash make this dish pleasing to the eye and the palate." In a large nonstick skillet, melt butter in the oil over medium high heat. Season chicken with half of the salt and half of the pepper, and add it to skillet. Cook until lightly browned, about 2 minutes per side. Transfer to large plate or platter, and cover to keep warm. Pour off fat from skillet, and add squash, zucchini, and tomato. Season with remaining salt and pepper. Cook and stir over medium-high heat until squash is slightly softened, about 3 minutes. Reduce heat, and return chicken to skillet. Cover partially. Cook until squash is soft, and chicken is white throughout but still juicy, about 5 minutes longer. Transfer chicken to platter, and cover with foil to keep warm. Raise heat to high. Cook vegetable mixture, stirring often, until almost all of the liquid has evaporated, about 2 minutes. Arrange vegetables around chicken, and serve. I made this for dinner; it was fast and yummy! I added some fresh sliced mushrooms, 1 tsp of minced garlic, and used a can of stewed tomatoes instead of the tomatoe. This was delicious. The second time I made it I added fresh green beans, as much squash as would fit in the skillet, and 3 tomatoes. Ground pork also works in this recipe. I loved this. My brother and husband found it a little bland, though they liked it enough to eat it. I thought it had plenty of flavor and I will definitely make it again.